You Are Here: Home » Feature » Is Hurricane Florence Re-forming, Coming Back as Kirk? Is Hurricane Florence Re-forming, Coming Back as Kirk? 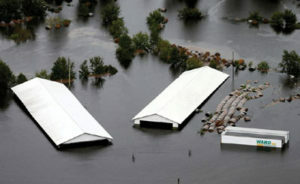 Side bar— At best 42 deaths have now been accredited to Hurricane Florence, due to the highest recorded flooding on record according to officials. Nine lives lost in South Carolina, two in Virginia, and 31 fatalities in North Carolina. More than half of those killed were in vehicles. It is estimated by North Carolina Gov. Roy Cooper that damage will be in the billions of dollars, there is still uncertainty since the flooding is ongoing. Labeled Disturbance 3 by the National Hurricane Center on Friday, the small storm system was given only a 20 percent chance of re-forming into an officially named tropical depression or storm within the next five days. But 20 percent is something, and it’s worth monitoring, since Florence behaved in a highly unusual manner, striking the East Coast from a position in the Atlantic that rarely occurs. And, the National Hurricane Center said in its Friday morning update, Disturbance 3 may find conditions more conducive to slow strengthening next week. “Although a combination of dry air and strong upper-level winds is expected to inhibit any significant development over the next few days, the environment could become conducive for slow development when the system moves over the southwest Atlantic Ocean during the middle part of next week,” the NHC said. If the system reforms, it won’t be called Florence again, since that name has been used and the storm has dissipated. The likely name next up would be Kirk, and it could impact the East Coast, possibly delivering more rain to the Carolinas. Meanwhile, parts of North Carolina and South Carolina continue dealing with widespread flooding from Hurricane Florence. Some areas received 30 to 40 inches of rain over days, and rivers are still flooding the region. A new round of evacuations was ordered Friday in South Carolina as the trillions of gallons of water dumped by Hurricane Florence meander to the sea, raising river levels and threatening more destruction, according to the Associated Press.